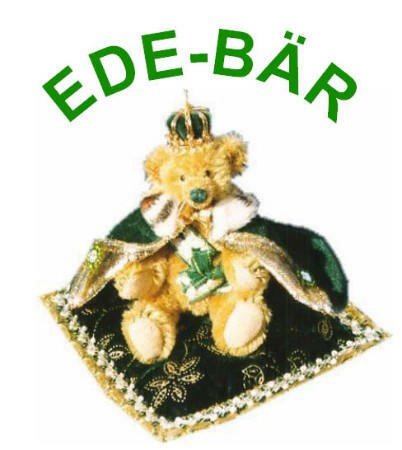 In the beautiful community of Dreieich, Germany, near Frankfurt, Heidi Schaefer lives with her husband and creates a world of bears and buds. "As early as I can remember, I liked to work with my hands. As a child, I enjoyed drawing and playing with my Barbie doll. I also liked reading and playing outside in nature," she recalled. "My first pocket money, that I earned at school was from crocheting caps and painting posters for other pupils." After her marriage, she continued to crochet and sew, making soft toys, lace, dresses, trousers and even clothing for herself and her son. She even began to make pottery. "I sculpted little things and soon bears began to appear from my ceramics." With the help of a neighbor, she got a job at a factory for polymer clay and sculpted advertising pieces for them like dolls, little bears, and doll house supplies. She attended fairs, taught dealers and showed customers how to work with the clay material. 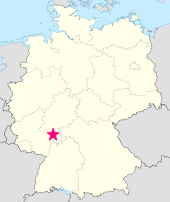 At this same time, she started visiting the Nuernberg Toy Fair yearly. It was a wonderful opportunity for her to see toys from all over the world. Taking inspiration from the fair, Heidi started making porcelain dolls in the style of half dolls and figurines referred to as "bathing beauties." 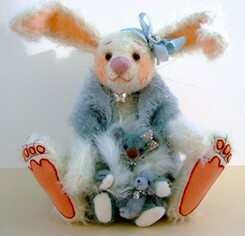 In 1993, she started her own business as a doll and bear maker and started to take part in markets and fairs herself. 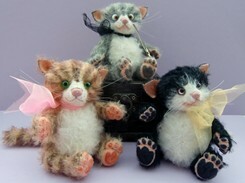 "The people loved my hand sculpted little bears, so more and more, I found my life drawn towards bears." 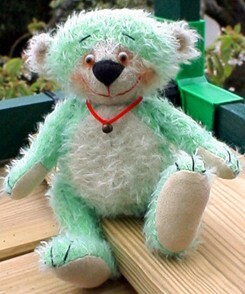 Around 1994, she created her first sewn bear. 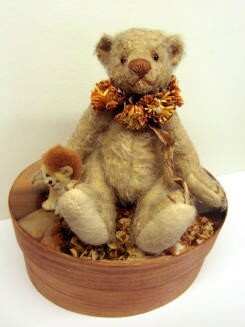 "While on vacation in England, I bought a bear kit but I did not love the pattern, so I never made the bear. 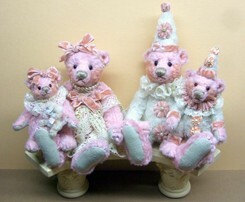 Later I found a classic pattern in three sizes and began making that bear." Even though she was making sculpted bears, she felt a desire growing within her to have a little bear from fabric that was moveable, like the big ones. After much research on miniature bear making, she began to understand how to make miniatures, but more than that, it inspired her to create her own patterns. 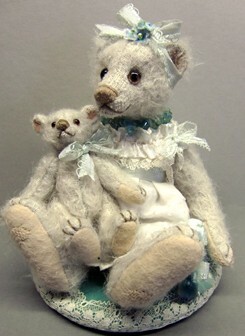 Heidi continued to make her dolls while still following her passion for bears. 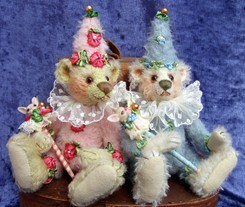 "I added a miniature fair and two bear fairs to my schedule. I love to go to fairs and I love to take part in competitions." Heidi found that even if she didn't win a particular competition, it helped her stretch her wings and create something special. She has two pieces now on display at the Puppenhaus Museum in Basel, Switzerland. "It is important for me to have every piece I create be as perfect as I can make it. Often it will take me a long time to search my stock to come up with just a tiny little detail like a little toy or the best matching ribbon or lace to give it the perfect touch." Heidi likes creating groups or families of bears when putting her pieces together. 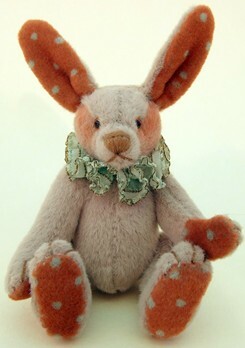 Heidi loves being a part of the worldwide community of teddy bears. Her bears have traveled all over the world. With the support of her husband, she's been able to take part in the creative world of bears, buds and toys. 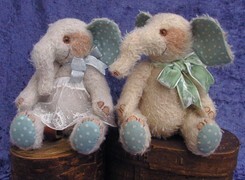 "I found friends and lovely people within the collectors, dealers and teddy bear makers. It is a friendly world." She noted, "I cannot travel as much as I would like, but my work can travel for me." And if she can not go geocaching, she collects treasure in a different way, through her hobbies of collecting old laces, vintage buttons and vintage and new rhinestone jewelry. Her best treasures, though, are the creations she makes which find their way into our hearts.